BARACOA, Cuba, Mar 23 2017 (IPS) - Clearings with fallen trees in the surrounding forests, houses still covered with tarpaulins and workers repairing the damage on the steep La Farola highway are lingering evidence of the impact of Hurricane Matthew four months ago, in the first city built by the Spanish conquistadors in Cuba. Baracoa, a 505-year-old world heritage city in eastern Cuba, located in a vulnerable area between the coast, mountains and the rivers that run across it, is showing signs of fast recovery of its infrastructure, thanks in part to the application of its own formulas to overcome the effects of the Oct. 4-5, 2016 natural disaster. “The ways sought to deal with the situation have been different, innovative. Necessity led us to involve the local population in addressing a phenomenon which affected more than 90 per cent of the homes,” said Esmeralda Cuza, head of the office in charge of the recovery effort in the people’s council of Majubabo, an outlying neighborhood along the coast. Standing next to a mural announcing the delivery of bottles of water donated to the families affected by the hurricane, the 64-year-old public official, with experience in dealing with disasters since 1982, told IPS that “more local solutions were sought” before, during and after Hurricane Matthew hit the province of Guantánamo. Internationally renowned for its effectiveness in protecting human lives during climate disasters, Cuba’s disaster management model is also undergoing changes within the current reforms carried out by the government of Raúl Castro, which includes local responses during the evacuation of local residents and the rebuilding process. “We had some experience in this, but never with the magnitude and organisational level of this one,” said Cuza, referring to what the strongest hurricane in the history of Guantánamo meant for this city. In a city where most houses have lightweight roofs, the hurricane wreaked havoc in 24,104 of the 27,000 houses in the municipality of Baracoa, population of 81,700. The local government reports that 3,529 homes were totally destroyed, 3,764 were partially destroyed, 10,126 lost their roofs, and 6,685 suffered partial damage to the roofs. This figure does not include multi-family buildings that were also damaged. One of these, located on the seafront, is waiting to be demolished. In addition, 525 government buildings were affected, as well as the power and communication networks, water pies, roads and bridges. Authorities say 85 per cent of the city has been restored, including 17, 391 houses that have been repaired. “At least here all the houses have roofs,” said Cuza, talking about the restoration of the 1,153 damaged houses in Majubabo. In the rest of Baracoa, 90 per cent of the damaged roofs were fixed, and you can still see some houses with no roofs or covered with tarpaulins on a drive through the city. Like everyone else, the office headed by Cuza is waiting for more materials to finish restoring the damaged interior of the houses. In the case of homes that were completely destroyed, authorities provided the so-called “temporary housing facility“, which consists of basic construction materials. With this support and salvaged materials, 3,466 families rebuilt part of their homes to be able to leave the shelters and shared houses where they were initially placed. This set of measures seems to be the reason for the rapid improvement in the city´s landscape, through which foreign tourists stroll. With painted facades and big signboards, the 283 rental houses and state-run tourist facilities have been operating since early November, when high season started. Contributions from the rest of the Cuban provinces, Cubans abroad and international cooperation have been arriving since October for the communities affected by Hurricane Matthew in the east of the country. For example, the United Nations is carrying out a plan that aims to mobilise 26.5 million dollars to address the urgent needs of 637,608 people in Guantánamo and the neighbouring province of Holguín. This UN programme has received contributions from the governments of Canada, Switzerland, Italy and South Korea. The Cuban government has also received assistance from Japan, Pakistan and Venezuela, as well as from companies in China and the United States and from international cooperation organisations, such as the Swiss Agency for Development and Cooperation. Some parts of the seafront promenade are still impassable while workers fix the two-kilometre wall, which barely defended the city from the waves. 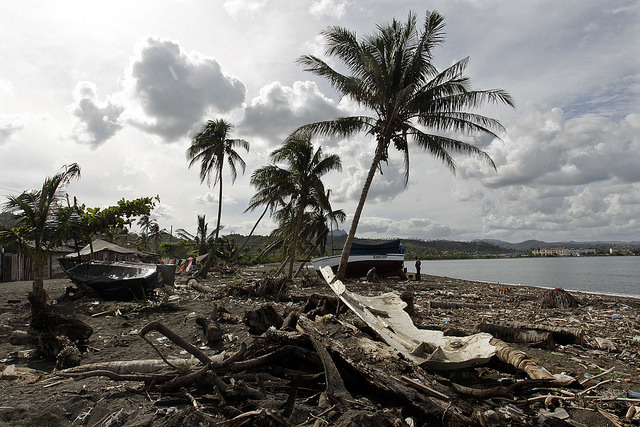 Because of their vulnerability to the sea, 21 coastal communities are to be relocated before 2030, including Baracoa. “The construction materials programme was launched to respond to the demand,“ said Rodolfo Frómeta, who is in charge of the state-run company that groups 12 small factories of natural rock materials and blocks, which plans to produce earthquake-resistant concrete slabs for roofs this month. Baracoa has the largest number of these factories, which also operate in the affected neighbouring municipalities of Imías and Maisí. Up to February, the 22 factories in the area had produced 227,500 blocks, using artisanal moulds and rocks collected from the surrounding land and surface quarries. “We only import the cement and steel,” said Frómeta, referring to the factories, of which three are state-run and the rest are private. 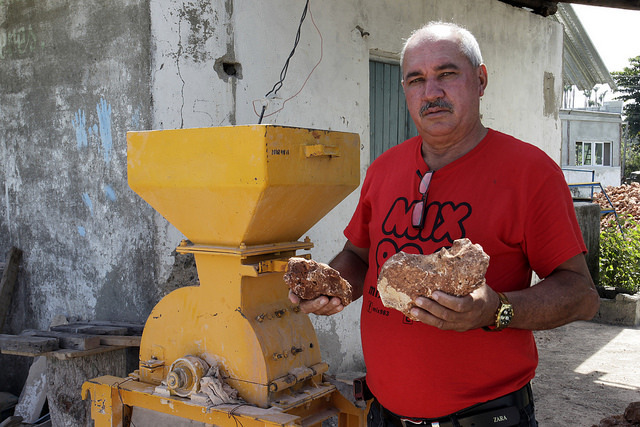 “But all of them receive government support, like these mills that grind stones,“ he told IPS in Áridos Viera, a company in Mabujabo. A psychologist by profession, Amaury Viera founded in 2015 this private enterprise, with the aim of turning it into a cooperative. Eight workers obtain sand, granite, gravel and stone powder. 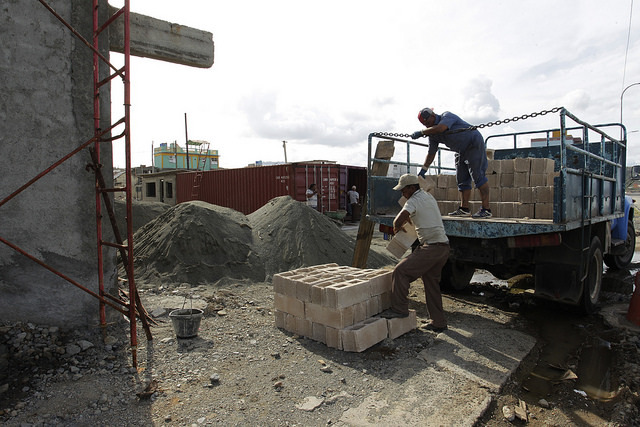 “Our main activity now is making blocks, some 800 a day, although we want to increase that to 1,200,“ said Viera. With his bag full of tools, the young bricklayer and carpenter Diolnis Silot is heading home for lunch. “I have worked in the construction of 35 houses since Matthew, two were fully rebuilt and the rest involved replacing lightweight roofs. Most of them received state subsidies,” he told IPS. A few metres away, the owner of a private cafeteria, Yudelmis Navarro, is installing a new window and making other improvements to his house. “The hurricane carried away the roof and some things from indoors. The government replaced the roof for free and now I am doing the smaller-scale repairs at my own expense,“ he said. “People who expect everything for free will not solve very much,“ Navarro said. On crutches, retiree Dania de la Cruz, one of the 167 people still living in shelters in the municipality, watches people going home for lunch, from the doorway of the large house where she lives with her daughter and three other families. “I used to live with my daughter along the Duaba river, on a farm, where I lost almost everything. I won’t go back there. We don’t know when or where we will have our new house,” she said. 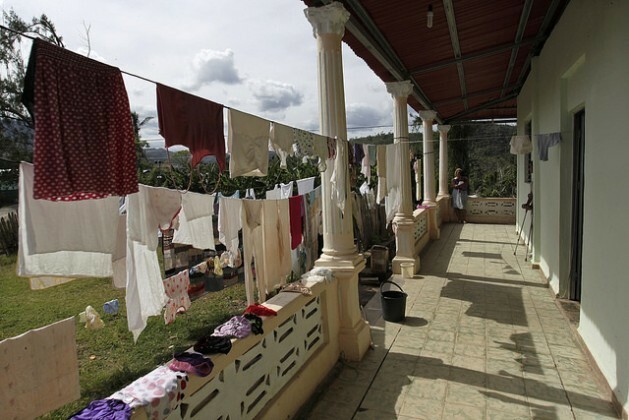 “The longest-lasting damages were in agriculture and housing,” said Luis Sánchez, the mayor of Baracoa. He stressed that the recovery strategy included modernising the new infrastructure and making it more resistant, for example in communications. So far, he said, 3,900 low-interest bank loans were approved for people to rebuild their homes, in addition to 700 subsidies, and more than 10,000 allowances for low-income families. Some families paid for the rebuilding out of their own pocket. “And we have gained experience in evacuation,“ said Sánchez, who mentioned the use of traditional shelters in caves and rural buildings known as “varas en tierra” made of wood and thatched roofs that reach all the way to the ground.